Who doesn’t want to make more money to help pay for the little extras in life? Or aspire to work from home or not at all? So it’s often tempting to click into these ads and headlines we see so often on Facebook or while surfing the web. But seriously? 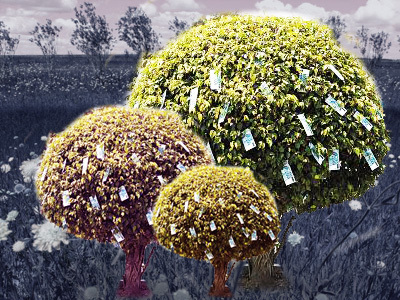 Is it really so easy to get rich quickly? 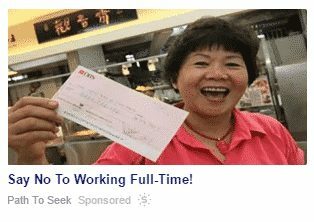 If you click into these ads touting easy ways to make money, you’ll realize they all have one thing in common. They use superlatives and mind-boggling claims. They imply that it is so easy so make money! This ad (above) is positioned like a news report, with links to news websites (which have articles about working from home but not about the specific programme being promoted). It’s a clever way of trying to mislead readers. These ads typically lead you to sign up for their programmes to make money, for say a low price of $19.90 (and when you try to leave the site, they will immediately reduce the price to $9.90!). But that’s not all, there’ll be more stuff to pay for once you part with your first payment! Or they try to hook you with a free training session. And if you do attend, they will persuade you to sign up for more advanced training costing thousands of dollars for a 2-3 day seminar. Many of these programmes that promise to teach you how to make good $$$ revolve around courses on different aspects of internet marketing or online trading. More important is the question – are these programmes effective? Some participants have said it’s a complete waste of time and money as much of the information is no secret, and can be easily gathered from books or online. Others find the courses useful because they help to shortcut the learning process. Many more are turned off by the constant up-selling and cross-selling of more courses and programmes, and constant iterations of the trainers’ ostentatious lifestyles (which you are told can easily be yours too if you pay for more training or join their membership programmes) – a common element in such seminars. 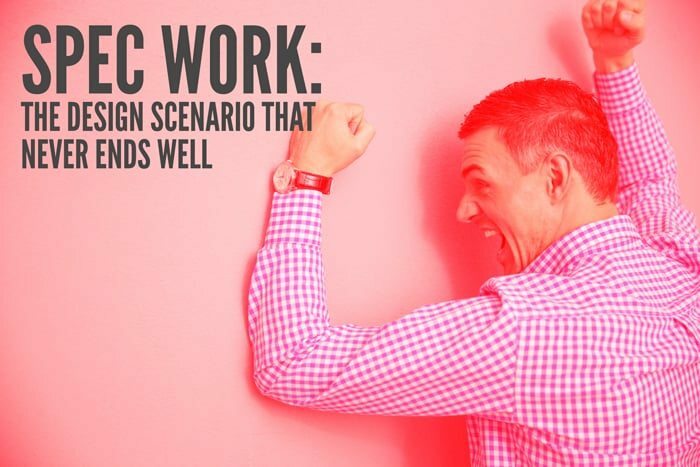 One thing is certain though – after the training (if it’s any good), you will have to work very hard to apply the concepts and techniques. It’s not going to be as easy as the ads or trainers claim! There may also be hidden costs (eg. web hosting fees, click fees to generate traffic) that will only become apparent once you start to implement what you have learned. So before you spend all your money joining these programmes, consider first if you can afford the investment! Then there is the other type of money opportunity (money-saving for them, money-losing for you) who prey on people who are trying to sell their services. If you are a freelancer looking online, even on well-known freelancer sites, for projects and business deals, beware! The company posting the job wants a “free sample” just so you they can assess your suitability. It’s not enough that you have shown them a strong portfolio. They want you to complete their assignment as a “test”. And if it’s a design piece, they want the files in high resolution! There’s a high chance that you may not hear from them once you’ve given them your sample. There is no reason for companies to doubt the quality of your work based on your portfolio, unless they are not serious about hiring you. Typically, the work’s creator will also lose their copyright to the work as part of the contest. Many are attracted for a chance to land the project but would have labored in vain. If you do take on spec work, eyeball the T&Cs and make sure it’s a company that you can trust to be fair. That’s because there are cheap-skate companies out to take you for a ride! Then there are companies, especially start-ups, that say they can’t pay you, but will give you a share of the profits once the company takes off. They argue that’s going to be worth more than your rate. It’s up to you whether to take that risk. But if you do, make sure you have a watertight contract with the company specifying the payment criteria and details. 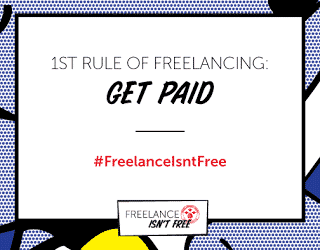 Other issues freelancers face are clients refusing to pay the full sum of the contract, insisting on cutting the payments due to excuses such as “quality not up to standard” or “liquidated damages” for not complying with an unreasonable request that was not put in the contract. 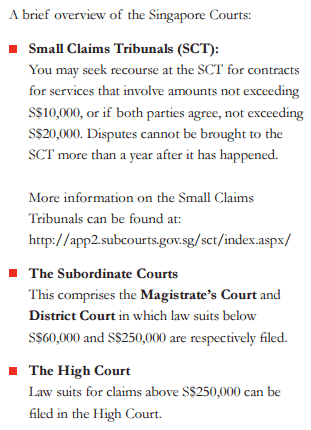 Currently, freelancers have limited options for redress, but NTUC members can call NTUC for legal advice. You can read more on your rights in this e-book for freelancers jointly developed by NTUC and LawWorks. In fact, it’s good practice for freelancers to sign contracts to specify not just payment details, but also job scope (and scope expansion), liability, and especially, on intellectual property. NTUC U Creative organised a Creative Freelancer bootcamp which included tips from Patrick Gan on how to structure contracts to clearly show your various rates, how to calculate your hourly rate and profit margin. You don’t have to agree to all the terms of the company’s contract. You can negotiate them. Better still, have your own standard contract. 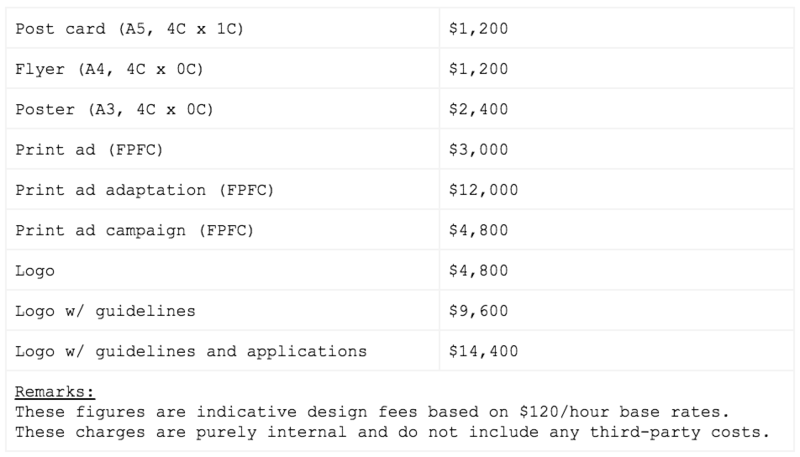 If you need a contract template or a reference, check out this handy guide. The Internet has opened up a treasure trove of opportunities for those of us seeking to earn a little cash on the side. There are apps that hook us up with people who want micro-tasks done, like walking their dog. Or be paid for taking online surveys. Or getting cashback for shopping with certain sites. Or driving for Uber, or renting out a room through AirBnB. But we won’t get rich quickly. For better earnings, we can go into internet content and affiliate marketing. But like any business, that requires time, commitment and some skills. Whether we are considering to join a programme or course that teaches us how to make better money, or to take up a project offered by a company/person we don’t know, the rule of thumb is to always find out more first. Just google “name+complaints” or “name+reviews”. If the promises sound too good to be true, they usually aren’t true. LK has travelled the world as a news journalist and enjoys interacting with people and listening to their stories. She likes to pen her thoughts and observations on family life, work issues, and anything that impacts societal development. She gets her inspiration from observing the antics of her three teen-aged boys and what goes on online.